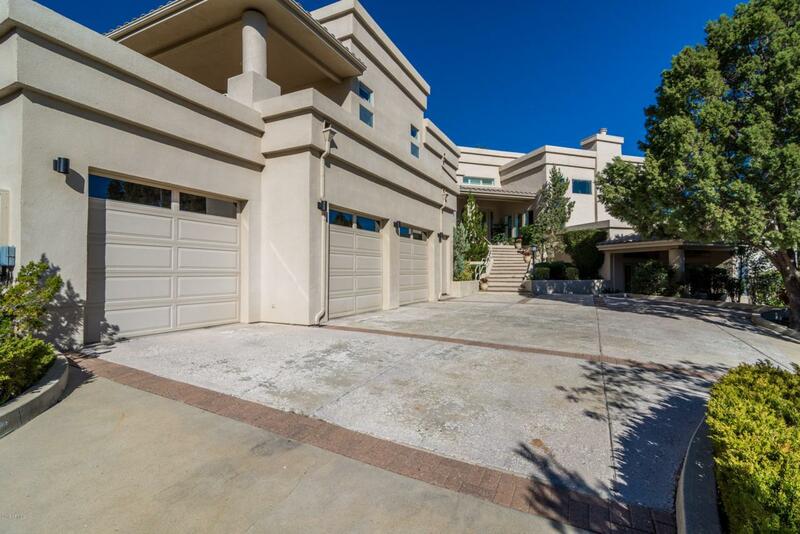 Amazing, contemporary, pueblo style home in the highly sought after luxury subdivision Ranch at Prescott. Centrally located to all of the shopping, entertainment, hiking, lakes and medical care. This home shows off amazing views of the Bradshaw Mountains, and the vast Northern Arizona terrain that can be viewed from any of the private patios throughout the home. The open concept of the home provides the perfect layout for an entertaining home or one that keeps the entire family involved. The split floor plan gives great privacy for the master bedroom and plenty of space downstairs for guests or the kids to enjoy their owns space.The home has crown molding throughout, custom trim, Anderson doors and windows, tons of built-ins, large office or guest room, huge laundry room, grand formal dining room, 3rd car garage/workshop with extra storage space. The master offers a private room just off the bathroom perfect to be an office or workout space, huge master closet that is the size of most bedrooms. Don't be worried about the stairs as there is a dumb waiter for to transport grocery's from garage to main level. This home has so much to offer at price that you can't replicate if building now. Come see this magnificent home!